My modular obsession has already gone way too far, I hope I won’t fall for DIY 500 series next. But it is tempting. Luckily there doesn’t seem to be many kit-providers over here in Europe. I bought myself an Intellijel TPS80W power supply and looking to install a barrel connector + rocker switch on the side of my case instead of using their Power Entry module. I’ll be using the Meanwell 90Watt brick which would require a DC In 15-18V 2.5mmx 5.5mm connector. It would be my first attempt at DIY so I was hoping someone could double check to see if getting the following pieces would do the trick? Or is the voltage rating on the connector linked below too small? Anyone made a DIY tube/valve mic preamp? Now that I’ve got a stable recording setup at home, I wouldn’t mind having a single channel of a really nice preamp. I’ve built a few tube guitar amps. Are you looking for a mic preamp? I believe FiveFish has a kit in 500 series. I’ll have a look at the FiveFish stuff. I guess part of making DIY pres is dealing with power supply/enclosure stuff too (ala euro stuff). Would love to see a single/stand-alone pre kit, though it’s nice to see that FiveFish has some compact PSUs too. I don’t know if this is reall the right thread - but I was hoping to get some advice on how to ‘debug’ DIY builds. I recently put together the WORNG LRMS module, and it almost works - but not quite. 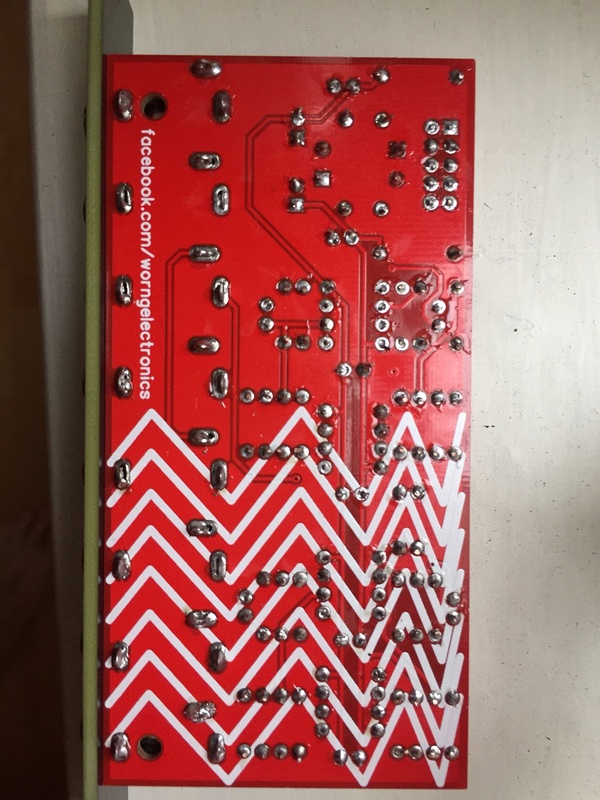 I’ve visually inspected my soldering and can’t see anything obviously wrong, and I have no clue what to try next. How do you all usually approach finding out what your mistakes are in DIY projects? After checking my soldering, I also check to see if I’ve put in anything backwards (caps, ICs etc). Search in the MW DIY forum to see if people had similar problems. But after that best way is to try to get a schematic, that usually helps a lot to trace the fault. Same as @mutedial, I often start with the schematic. Since I don’t actually fully understand them, I generally try to trace current flow through the schematic, find a point across which the voltage is as expected (power input is a good place to start), and then follow the schematic point by point until I find where the breakdown is happening. Or, if there’s a jack that’s not outputting, working backwards from there until you do have voltage. 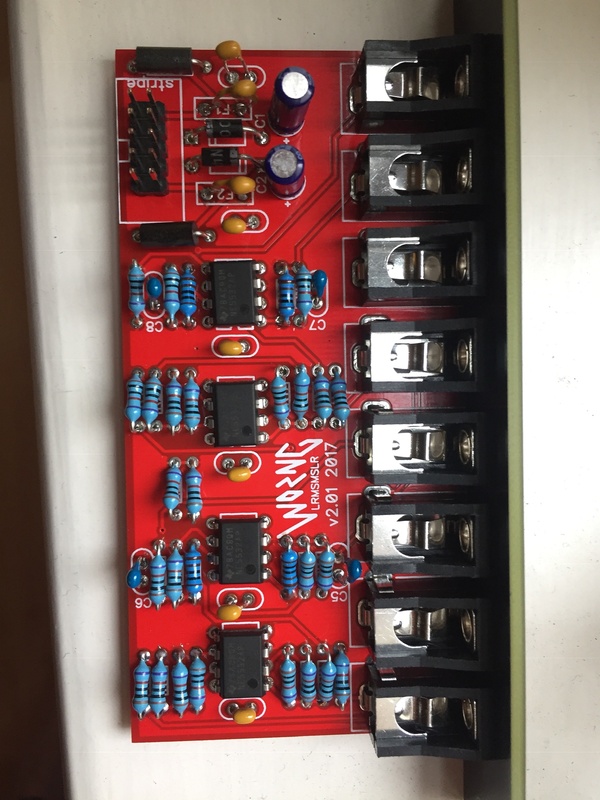 Can you post decent quality photos of both sides of your board? Maybe one of us can see something you’re not seeing. My personal points of failure tend to be ICs that I’ve mounted in the wrong orientation, and when doing SMD, caps that I’ve failed to solder correctly (it’s always caps for me). For me, its usually a component oriented incorrectly or a small solder bridge that I just couldn’t see. You may try taking a small brillo pad or similar, non-conductive light abrasive and running it gently across the joints as if you were cleaning them. It also depends on what you mean by “almost works”. Try to back into the diagnosis from the symptom if you can. Having a reliable multimeter can help - check for known voltages (i.e., 12v at the power headers, correct voltage feeding any ICs, etc.). I eventually broke down and purchased a Fluke because I was tired of second guessing my work. I also build tube amps and have cooked more than one cheap MM with high voltage. You probably don’t need a Fluke, though. Great advice above. Sometimes just taking a step back and looking at it with fresh eyes reveals something obvious (so obvious that you weren’t even looking for it in my case sometimes- a number of times I’ve put one together, fired it up, nothing… only to realize I didn’t put the ICs in their sockets. Duh). I have an unracked LRMS and could send a pic or take measurements or whatever, just shoot me a PM if you’re feeling stuck. Thanks for all the advice! I’m going to take a closer look tonight and see if I can work out what’s wrong. So far as I can tell the ‘mid’ channel never gets to the ‘right’ output of my module - so if I plug audio straight into side/mid inputs, whilst monitoring the L and R outputs, I hear the audio from L as expected, but I only hear audio from the side input coming from the R output. In addition the volume of the R output is notably quieter, even when I am only passing audio into the side channel. A lot of those solder pads on the top half don’t look like they have solder on them to make the connection. On the top right especially, some look like they weren’t soldered at all. Yeah maybe just try soldering a little more on some of those joints - make sure you’re heating the pin and the pcb. If you happen to have some flux that can be helpful but by no means a necessity. If you’re iffy about your soldering another little trick is to lay the module on a nonconductive surface like a piece of wood and gently press with your finger (or an eraser if you’re paranoid about voltages) on components while a signal is running through - just be careful not to create any shorts. If signal all the sudden starts passing when you press on an IC or resistor then you can be pretty sure you have a bad connection. Poking things with a chopstick can be very revealing. My poker of choice is a pointed bamboo kabob skewer. Flow some new solder over the joints. Don’t leave any gaps. Don’t create any bridges. Use a judicial amount of solder but make sure all joints are complete and shiny (like a Scantron bubble sheet - make sure the holes are filled completely). Place the soldering iron so it touches all components you want to connect. Touch your solder to one of the components you are heating. Watch the solder flow onto all components evenly (move solder to the other component if necessary). Remove the iron by the end of your 8-count. Be careful not to move the work at all for about 4 more seconds - make sure the solder sets back to solid form or you could break the joint. 8 seconds could be way too long depending on the temperature of your soldering iron. Agreed. However, for the passive components above, it should be fine for an average 25w iron or so. I would recommend beginners socket any ICs to avoid problems with them.